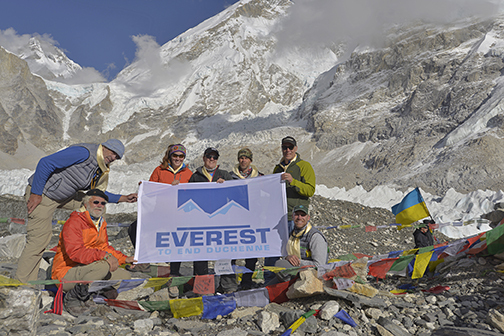 Hikers, outdoor enthusiasts and climbers of all skill levels are invited to join the Everest to End Duchenne team on its second trek to Mount Everest Base Camp on September 25. The 2017 trek is part of a symbolic journey that represents what boys battling Duchenne muscular dystrophy (referred to as both DMD or Duchenne), face every day as their muscles lose function. The effort supports the Hope for Gus Foundation, a non-profit organization that raises funds for medical research for DMD. Duchenne is a fatal, terminal, muscle-wasting genetic disorder, affecting one in 3,500 boys born each year. By age 12, most boys with DMD are in wheelchairs. They rarely live past their mid-20s. At present, there is no cure or effective treatment, but there is hope, as several promising new treatments, specifically in the field of gene therapy, are being developed. One such therapy, a gene editing technology called CRISPR, has potential to cure not just Duchenne, but many other genetic disorders. The first Everest to End Duchenne trek in 2015 was the Hope for Gus organization’s highest grossing fundraiser ever, which is why the organization will embark on its next trek on September 25. All funds raised with this trek will directly fund medical research. In addition, a GoFundMe campaign has been launched and sponsorship opportunities associated with the hike are also available. To be part of the 2017 trek, you must be 18 or older (unless accompanied by a parent or guardian), be reasonably fit and able to walk five to eight hours a day, possess an adventuresome spirit and desire to make a difference. The 120-km, 17-day journey begins in Kathmandu and includes an exploration of Nepalese culture, visits to traditional villages, Buddhist mountain monasteries and bazaars, and culminates with the arrival to Everest Base Camp, high in the Himalayas, more than 18,000 feet above sea level. Although a demanding journey not meant for the faint of heart, trekkers need not be elite athletes or experienced climbers to complete or enjoy the journey. Participants are required to raise a minimum of $1,000 and are also responsible for individual travel expenses. Gus is currently part of a clinical trial testing a treatment drug that may give the Dreher family more time together as doctors search for a cure, but Gus continues to lose muscle function, and time is of the essence. This year’s team is creating a flag to wave at Base Camp with the names of nearly 1,000 people who are either living with, or have lost their lives to Duchenne. They will carry this flag with them for the entire journey, as a symbol of trekking for those who cannot and carrying them to the rooftop of the world, a journey that their own bodies could never take. To learn more about Hope for Gus or becoming a part of the 2017 Everest to End Duchenne trek, email info@hopeforgus.org. The sign-up period closes Friday, August 11. Photo: 2015 ETED team – Chris Balch, Gregg Kaloust, Anna Johnston, Tonya Dreher, Dave Welton, Kent Annis and Brian Stoudnour. Y’all are amazing. I’m looking forward to following along on the blog and social media!